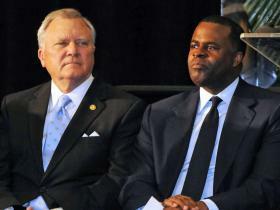 Atlanta Mayor Kasim Reed (r) said he disagrees with Gov. Deal (l) on when it comes to providing for unaccompanied minors. Gov. Nathan Deal recently wrote a letter to President Barack Obama. Deal accuses the president of neglecting to tell state officials about more than 1,000 unaccompanied minors sent to Georgia. Tuesday, Atlanta Mayor Kasim Reed responded to the governor’s claims. In the letter, Deal told the president the state wasn’t prepared to accommodate the children. He said many mayors and lawmakers agree that it’s time to “reign in the influx of refugees” to Georgia. Reed said he’s not one of those mayors. The children, who come from Guatemala, Honduras, and El Salvador, are apprehended at the U.S./Mexico border. They’re placed with sponsors, usually family members, while they await a court date. Those who qualify for special juvenile status can stay, but all aren’t eligible. Reed said they should all be welcomed. “It’s very important that we send a signal that we’re going to be a welcoming community, that we’re going to allow these folks to be trained, and to treat them well, certainly children, there should be no debate about this,” he said. A spokesperson for Gov. Deal says there’s been no word from the Obama administration.